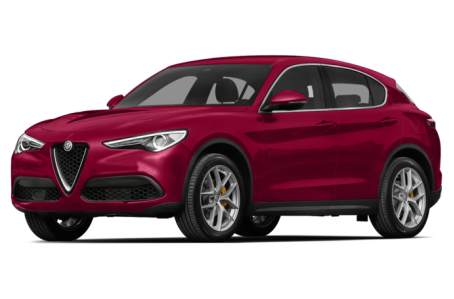 The Alfa Romeo Stelvio is named for the famous, twisting Stelvio Pass in the Italian Alps and designed to be both a looker and to offer performance driving dynamics in a practical SUV package. The Stelvio will compete with such SUVs as the BMW X3 and Audi Q5 and Jaguar F-Pace. The Stelvio is a taller and more muscular hatchback version of the rear-drive Alfa Romeo Giulia sedan with which it shares the platform and Alfa's "la meccanica delle emozioni" (the mechanics of emotion) design spirit, though the bulk of the SUV's design dilutes the sedan's sleek lines and shape. The Stelvio gets revised front and rear bumpers and reshaped lower front air intakes, but it has very similar LED-accented headlight pods, taillight design and lower rear bumper. Base and Ti trims levels will be offered; the most aggressive design cures and aero features are reserved for the Quadrifoglio performance version. Prominent on the nose, of course, is the brand's signature triangle grille on all models. All models get a leather interior; the Ti model gets some fancier details, including real wood trim, and offers additional interior packages in sport and luxury flavors. A rotary dial controls the 6.5-inch or 8.8-inch display screens; coming later is a 3-D graphic navigation that will recognize handwritten gestures on the top of the rotary pad. All Stelvio models will feature Apple CarPlay and Android Auto. A power liftgate is standard. The top-level Stelvio Quadrifoglio adds leather and Alcantara 12-way power front seats, a special leather-wrapped steering wheel, leather-wrapped instrument panel with accent stitching and carbon-fiber trim. Available on the Quadrifoglio will be lightweight, carbon-fiber-shell Sparco racing seats with manual adjustment. The base and Ti models get a turbocharged 2.0-liter four-cylinder that puts out 280 horsepower and 306 pounds-feet of torque. It will be mated to an eight-speed automatic transmission. At the top end, the Quadrifoglio performance model, like the performance version of the sedan, gets a Ferrari-derived 505-hp, twin-turbocharged 2.9-liter V-6 which puts out 443 pounds-feet of torque. Alfa says it will propel the SUV to 60 mph in 3.9 seconds and to a top speed of 177 mph. Transmission choices have not been specified. The engine includes cylinder deactivation to improve fuel mileage. All-wheel drive is standard on all models, including the Quadrifoglio, and the rear-bias system can send up to 60 percent of torque to the front wheels. An adaptive suspension is available on lower trims and standard on the Quadrifoglio, as is a torque-vectoring differential. The Stelvio has a selectable drive mode system; Quadrifoglio models get Alfa's more sophisticated DNA Pro drive mode selection system that adds a Race mode. The performance model also offers Brembo carbon-ceramic brakes. Alfa says the Stelvio will boast the same 50-50 weight distribution as the sedan. A backup camera and rear parking sensors are standard. Available are full-speed forward collision warning with automatic emergency braking, adaptive cruise control, lane departure warning, blind spot monitor, front parking sensors and rear cross-traffic alert.